Xi Jinping announced a $10 million donation to UN Women. Liberia has less than 13 months to assume full responsibility for its own security, as the UN peacekeeping mission draws down. With many Liberians uneasy at the prospect of an eventual withdrawal of the mission, the government needs to establish clear priorities now to be prepared. 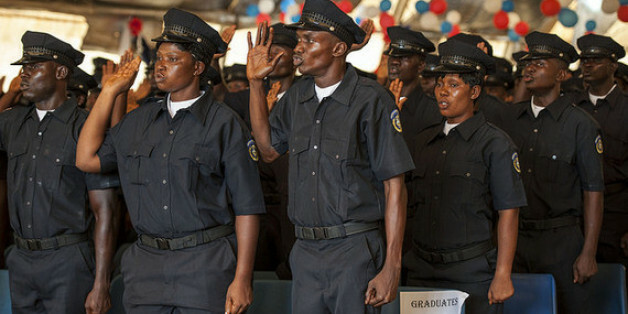 Liberia has 14 months to assume full responsibility for all facets of its security. Lessons learned during the Ebola crisis can help ensure a successful transition. Could Liberia's Democracy Become Ebola's Next Victim? Liberia has increasingly been stuck in the kind of siege mentality that residents thought they'd left behind with the end of the civil war in 2002. In short, Liberia's Ebola crisis has become as much a governance crisis as a health crisis. This is a manageable public health crisis that we know how to solve, but doing so requires our focus, our attention, our resolve and our resources, tools that only the United States has. There is no question that Africa faces many serious issues on the road to development. But a new reality is emerging. It is time for perceptions to change as well. Despite their increasing presence on the global stage, the relative effectiveness of women national leaders in growing the world's toughest economies compared to their male counterparts was largely unknown -- until now. To give Liberia a better chance at overcoming its past and moving toward a more prosperous future, the international community must escape from its self-perpetuating cycle of underachievement. We must take a stand if we want the 21st century to be one of change and reformation, one that converts oppression into opportunity for women worldwide. We know -- as generations before have professed -- that we cannot achieve sustainable development, that we cannot build healthy and empowered communities and nations when we continue to deny half the world's population their basic human rights and fundamental freedom. On International Women's Day, my daughter asked me why the world was run by men. I had the answer to my daughter's question in my hands -- anchored in the notion that women empower women in so many modern ways. As the world marks International Women's Day with pledges to end violence against women and girls, I reflect on the life of 13 year-old Olivia, who was repeatedly raped by an uncle when she was just seven years old. Although the Charles Taylor verdict is drawing attention to Liberia once again, it is also a reminder of how far Liberia has come since that dark era. Do you see yourself as forceful, controlling and competitive? Or powerful, capable and driven? Words matter, beliefs matter. Take care what you say; it shapes the way you think. Women are at the center of our world's development. Women are the mothers who bear and care for children, and they play an important economic role. Empowering women is key to boosting the well-being of many rural societies. The event marked a shift in action -- we are tired of waiting for men to open the door for us. Ladies and gentlemen ... in the 21st century, we are opening the doors for ourselves. Even in the continent that hosted the previous FIFA World Cup, the sight of girls playing soccer is still a rare event. Traditional perceptions on the role of girls still prevail pervasively, affecting the participation of girls in various sports. Africa is taking command of its future by tackling an ancient plague. If you care about peace -- and the prosperity of every woman, child and community -- you must care about malaria.